Combined with the Scott Essential Rolled Hand Towel dispenser, Scott Essential Slimroll provides you with a hygienic and economical solution to hand drying. Each roll is 150m long providing a total of 900m of towel per pack of six. When you choose the SCOTT® Brand, you make practical choices without compromising on quality and value. For uncompromised clean, every single time, our hand towel works with the most hygienic dispenser vs. the competition for use in an environment where increased hygiene and cost-efficiency are critical (e.g. healthcare or education) yet space is limited. 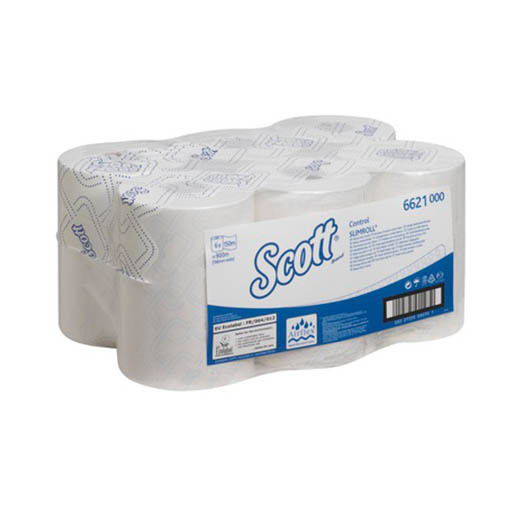 With SCOTT® Control, the compact roll requires fewer refills and helps you fight against cross-contamination. Designed to provide you with the latest in hygiene innovation, these hand towels are embossed with the SCOTT® Brand and are kind to hands to actively encourage hand hygiene within your workforce. Our unique Airflex* Technology ensures that each towel is ultra absorbent, especially when compared to conventional paper towels. Airflex* fabric remains strong when wet, preventing it from ripping, whilst retaining its soft and comforting texture. SCOTT® hand towels carry the European Ecolabel; your guarantee that they are manufactured responsibly at every step of the process. This product is sold as 6 x 150m = 3,600 sheets, white, 1 ply SLIMROLL* rolled hand towels (900m total).